Why is foot function important? The foot is a highly complex organ of balance and propulsion. It acts not only as a foundation for movement, but also it affects motion higher up into the body. Misalignments can cause all manner of foot, ankle, knee, hip and back pain. The repetitive nature of running in particular places high demands on the body’s anatomy. This puts extra strain on the bony structure of joints and soft tissue structures such as ligaments, tendons, and muscles. These can be very effectively used to correct biomechanical problems by realigning the body to relieve stresses being caused at any point from hip to heel. It is a common misconception that one type of orthotic fits all. There are hundreds of different foot conditions, each needing a slightly different orthotic prescription. Over 24 years in practice Mike is particular in his choice of orthotics. 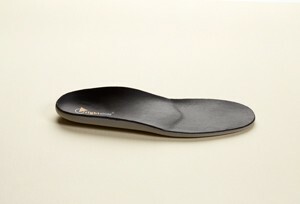 He offers a wide range of quality orthotics and insoles to suit most budgets and pathologies. 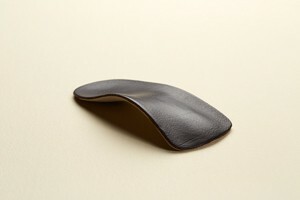 Premade Orthotics Some orthotics can be customised and issued immediately on the premises, using a “chairside” system. (Mike was involved with researching this system over 5 years and published the results in “Podiatry Now” magazine – a peer reviewed journal by the Society of Chiropodists). Fully prescriptive customised devices can be made to measure after taking casts of the feet. This is done using the latest CAD/CAM technology to produce some of the most advanced, comfortable and hard-wearing orthotic devices available on the market. “Having been a recent sufferer of a painful heel condition, I can now fully attest to how bespoke orthotics can resolve a condition and allow the return to normal sporting activity.